Posted on September 20, 2016 at 3:32 pm. 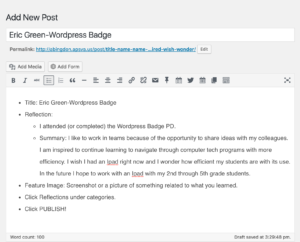 I attended (or completed) the WordPress Badge PD. Summary: I like to work in teams because of the opportunity to share ideas with my colleagues. I am inspired to continue learning to navigate through computer tech programs with more efficiency. I wish I had an Ipad right now and I wonder how efficient my students are with its use. In the future I hope to work with an Ipad with my 2nd through 5th grade students.